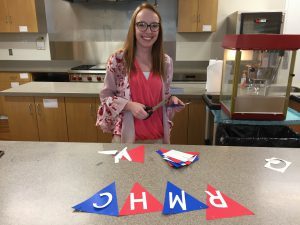 Kathryn helps prepare for a community event. Summer 2018 Intern Kathryn Coaker shares more about her experience working hard to keep families together when they need each other most. This summer I had the amazing opportunity to intern at Ronald McDonald House Charities of Alabama (RMHCA). As a graduate student, I have had many internships, but I am here to tell you that interning at RMHCA is the best! If you are considering an internship somewhere, I encourage you to look into opportunities at RMHCA. I promise you won’t regret it! “With diligence, integrity and compassion, Ronald McDonald House Charities of Alabama joins and aids families in their efforts to find hope, support, happiness, and growth, regardless of obstacles placed before them.” – This is what you get to be a part of as an intern at RMHCA! How awesome is that? It’s not everyday that you get to walk into an internship and know that you are a part of helping families be together when a child needs medical treatment. When you intern at RMHCA, you meet amazing families and get to be a part of their journey to find hope and happiness. The people you work with makes a huge difference, and the staff at RMHCA is absolutely amazing! They work hard each and every day to ensure that the families are well cared for, and they do it all with humble spirits and bright smiles. Whether they are staying late to finish a project or cooking a meal together for the families to enjoy, they are always focused on the mission! RMHCA staff not only goes above and beyond for the families of the House, but they care for one another as well. As an intern, you will be surrounded by people who want to see you accomplish big things, and they will give you the support and encouragement you need to make it happen! Speaking of accomplishing big things, you will be a part of important work during your internship! As the General Intern, I had the opportunity to be involved in many aspects of the charity. My main focus, though, was expanding the Pop Tab Recycling Program. I was able to collect feedback from previous participants, redesign the program packets that are distributed to schools across the state, and speak with businesses about partnership opportunities. My other projects included creating an informational notebook for guest rooms, learning how to enter donations into the fundraising system, assisting families at the front desk, and giving tours of the House. To top it all off, I got to help with special events like the Ronald McDonald House Golf Classic and the Heart of the House Gala! The opportunities are truly endless when you intern at RMHCA. I hope you can see how incredible the internship program is! Your work is important, the people are wonderful, and the mission makes every day more rewarding than the last. Sounds pretty amazing, right? Then what are you waiting for? Apply for an internship today!